Say hello to the S1, C1 and P1! 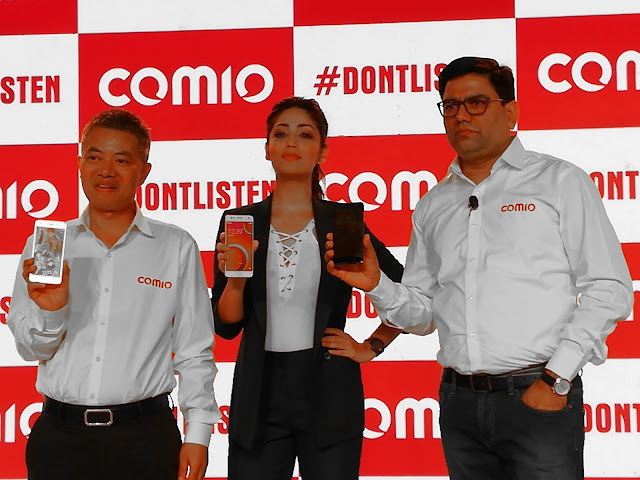 COMIO enters the Indian market with the launch of its flagship handsets S1 and P1 along with the third smartphone, C1. Building on the legacy of its manufacturer - Topwise Communication, COMIO smartphones have been designed keeping the Indian consumer in mind with a range of innovative, technologically advanced and user friendly features and products. Headquartered in New Delhi, the brand seeks to cater to the mid-level segment which is the fastest growing smartphone segment in the country. Celebration Of Design: The COMIO S1 sports a metal unibody with curved edges and is available in two colour variants - Royal Black and Sunrise Gold. The USP of the handset lies in its slim design and metallic finish which makes this phone easy to carry and visually appealing in equal measures. One can unleash their inner photographer with a 13-megapixel Auto focus with flash rear camera and 8-megapixel selfie camera that accentuates every intricate detail. Paired with a 5.2-inch HD IPS display, front finger print sensor, 2GB RAM and a 2700mAh battery that makes COMIO S1 a device worth buying. Long Lasting Battery Life: The COMIO P1 is packed with a 5000 mAh battery that’s built to last. Available in a Metal Grey and Sunrise Gold colour variants, it comes in a metal body with a dual-SIM phone offering, 5.5-inch HD IPS display screen, finger print sensor, 3 GB RAM, 13-megapixel Autofocus with flash rear camera and 8-megapixel selfie camera with screen flash. The smartphone ensures 24 hours talk time and 30-day standby time. Exhilarating Audio: The COMIO C1 sporting a metal frame comes with Hi-fi music that offers consumers a multidimensional cinematic listening experience, bringing them closer to the action, delivering extraordinary sound quality. Whether listening via the stereo speakers or headphones, even the most discerning music fans will be blown away by the sound quality. The COMIO C1 will be available in Mellow Gold and Space Black variants and comes with 32 GB internal memory, 5-inch HD IPS display and 8-megapixel autofocus with flash rear camera with 5-megapixel selfie camera. All the three smartphones run on a Quad-core 64 bit Mediatek chipset, with 32GB internal memory and are 4G VoLTE enabled. Designed to deliver, our COMIO smartphones is a perfect balance of powerful performance, fast connectivity and better battery life. The devices are also embedded with the Freezer and Clone Application. The Freezer app allows you to as many applications as you wish without the worry of space constraints whereas the Clone app makes sure that all that data from your device is backed up at all times. The Clone app also allows for ease of transfer of data from one handset to another. COMIO smartphones come with the valuable anti-theft feature preloaded in all handsets. In case of any suspicious activity, SIM based alerts are shared with the registered mobile number. One of the interesting feature of Anti-theft is the image click seek, wherein when someone tries to unlock the device by trying to break the pattern or PIN, the device will automatically take the image of the unauthorized person. Other options include the lock and unlock feature, shutdown blocker, data back up, and SIM related functions. To celebrate their arrival in the market, COMIO is also offering its customers a very special after-sales service. COMIO will be offering 30 day DOA, a special buy back and upgrade offer allowing you to upgrade your old smartphone. The COMIO upgrade offer, allows you an assured 40% return on your old COMIO phone (Not more than 12 months old) which will be given if you want to upgrade you existing COMIO phone. Applicable through www.comio.in only. Additionally, all three smartphones also come with a free one-time screen replacement warranty within six months of purchase to supplement the one-year + 100 days’ extra manufacturer warranty. COMIO’s launch campaign, ‘Don’t listen Kar Daal’ is inspired by the youth of today that are willing to take on risks and go beyond the ordinary. Designed to connect with the youth of our nation, COMIO smartphones aim to empower them with the power of highest memory, camera, battery life and tons of features. The campaign will connect with the youth through social media channels and on-ground activations. COMIO will also have an exclusive data tie-up with Reliance Jio, which will offer packages with additional data benefit, especially designed for the youth. With a recharge of Rs.309 or above, consumers will get a 5 GB additional data voucher on their handset. COMIO smartphones entered the Indian market in May 2017. Building on the legacy of its manufacturer-Topwise Communication, COMIO smartphones have been designed keeping the Indian consumer in mind. Headquartered in New Delhi, the brand caters to the mid-level segment which is the fastest growing in India through a range of innovative, technologically advanced and user friendly products. The brand launched its first smartphone in China in 2015.